The key creative team (producer, director, screenwriter). 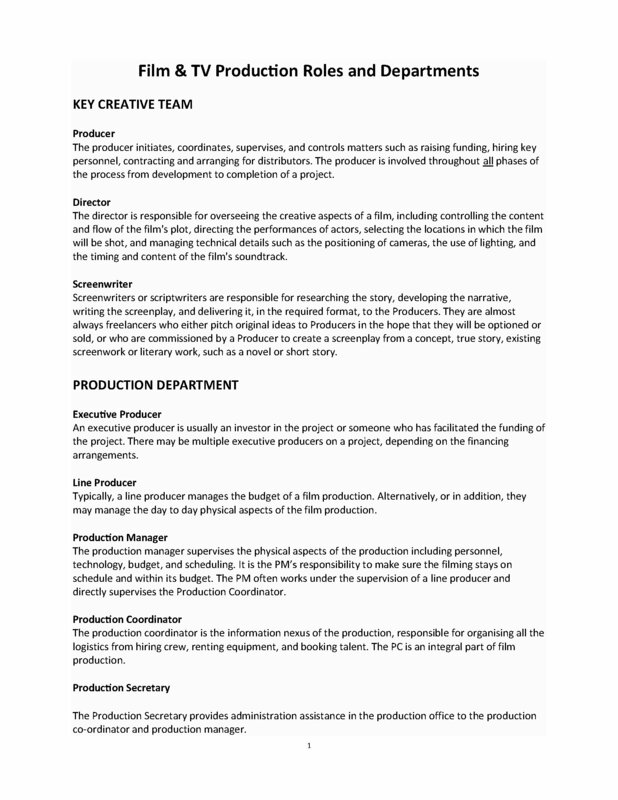 The production department (executive producer, line producer, production manager, etc). The script department (story producer, script editor, script co-ordinator). The location department (location manager, location assistant, scout). The camera department (DP/cinematographer, camera operator, 1st assistant camera operator, etc). The sound department (sound recordist, boom operator). The grip department (key grip, best boy, dolly grip). The electrical department (gaffer, best boy, lighting technician). The art department (production designer, art director, set designer, props master, etc). The hair and make-up department (make-up artist, hairdresser). The wardrobe department (costume designer, costume supervisor, costume standby, etc). Post-production (film editor, assistant editor, colorist, etc). Visual effects (FX supervisor, compositor, roto artist, etc). Post-production sound and music (sound designer, dialogue editor, sound editor, etc). Other production crew (casting director, storyboard artist, caterers, etc). Interactive media (producer, designer, developer, etc). 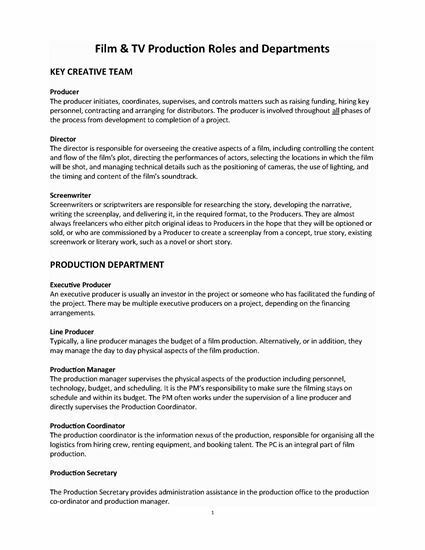 The free Guide to Film & TV Production Department Roles is a valuable learning tool for anyone just starting out in the movie business. Download your copy now.